NIERMALA S. BADRISING, Minister for Foreign Affairs of Suriname, welcomed the Organization’s commitment to sustainable development. 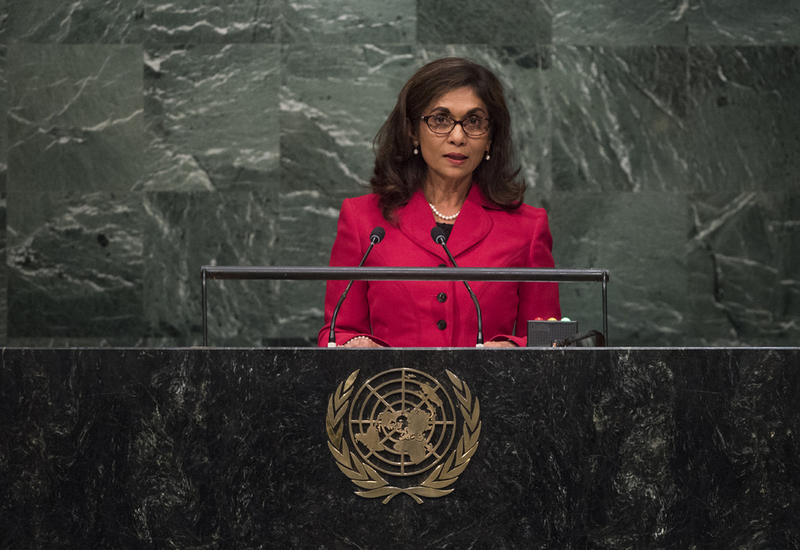 Combating climate change was especially high on Suriname’s agenda, she said, noting that, although it was the smallest South American country, it housed 8 per cent of the world’s untouched tropical forest. Adding that approximately 94 per cent of the nation was covered by rainforest, making it the “greenest” country on Earth, she said its rivers carried between 10 and 15 per cent of the global fresh water supply. Home to some 239 miles of low-lying coastline, Suriname continued to bear the burden of the effects of climate change and was one of the seven most vulnerable countries with respect to the effects of rising sea levels. To address that, it looked forward to a new global agreement at Climate Conference in Paris in December. In that vein, priority must be given to the availability of financial resources, particularly to small island developing States and countries with low-lying coastlines. Turning to other issues, she welcomed the normalization of bilateral relations between Cuba and the United States, underscored the importance of upholding the Universal Declaration on Human Rights as a “cornerstone document”, especially with regard to the current refugee crisis, and welcomed the political participation of women at all levels of local, national and international government. Lastly, she said, while the United Nations had inspired positive progress over the last seven decades, economic and social inequality remained alarming. Human-centred economic policies would address that and would ensure the realization of social development for all peoples, she said in closing.